Your community is kept safe by probation staff. When people are released from prison or are given a community order, probation staff help them find work, find somewhere to live and readjust to living in society again. Without a well trained, capable and well-funded probation service none of this is possible. Unfortunately, this work is in danger thanks to one of Chris Grayling’s hare-brained privatisation schemes. In 2015 the then Justice Secretary Chris Grayling pushed through the sell-off of 70% of this long time public service – the most extensive privatisation in the criminal justice system ever. As a result, ill-considered and reckless moves towards privatisation have jeopardised the quality of probation work - which have worsened accountability, stretched workers and increased dangers to public safety. In June 2014, the Conservative government announced its plan to ‘revolutionise’ the probation service. 35 publicly owned, self governing regional probation services were split up and sold off. 70% of cases are low risk offenders, dealt with by 21 ‘Community Rehabilitation Companies’ (CRCs). These companies are tendered out to private organisations and are responsible for probation across a region of the country. 30% of cases are high risk offenders, which are all dealt with by our public National Probation Service. In 2017, the government changed the terms of the CRC contracts, handing out more money to the private contractors, because of ‘unforeseen challenges’ that the contractors had faced. The National Audit Office investigated these changes and found that the CRCs had underperformed, and been rewarded with a pay rise. The taxpayer has taken the strain of this extra payment, once again shouldering the risk of providing public services, while private companies pocket the profit. What are the effects of privatisation? 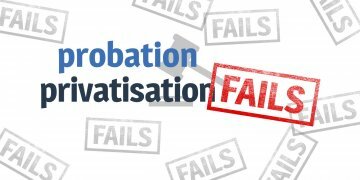 Probation services were working well under public ownership: In 2013 the Ministry of Justice rated all 35 publicly owned probation trusts in England and Wales as good or excellent. But despite this, the services were privatised in 2015 without pilot schemes and in the face of widespread opposition. In 2017, HM Inspectorate of Probation found that the NPS was protecting the public well, but that the private CRCs were failing in half of cases. Conflicting interests - between public service and profit motives - also threaten public safety. Since privatisation, the number of convicts committing a serious further offence while under probation supervision has risen 20%. CRCs are failing to meet 2/3rds of their targets on average - with the worst performing company only meeting 4 out of 24 target measures. These failures are a risk to the safety of the public and staff as well as the wellbeing and future of the offenders. "A living hell. Very disorganised and chaotic. It's all about hitting targets for the business, but completely missing the point for service users. It's about the money results, not the real results, which is ultimately protecting the public." "It feels highly pressurised, confusing, chaotic and unprofessional, a commercial organisation dedicated to making money for investors." A report released in 2016 by Dr. Gill Kirton, which surveyed staff in CRCs, demonstrated that many staff have expressed concerns about increasing risks to their safety in working conditions. Since the sell-off, for example, working practices have become more isolated. Alongside this, open-plan offices have been introduced in many of the centres, meaning that probation officers often have to conduct sensitive interviews with offenders in front of their colleagues. Union surveys show more than half of those working for private firms in the probation sector are now looking for new employment. Kirton’s report also discusses the impact of privatisation on the National Probation Service, which is still publicly owned. Now left to deal only with high-risk and harrowing cases, increasing levels of stress and mental health problems have been reported among staff – who used to have more of a balanced caseload. Staff of CRCs are also feeling the pressure. Sodexo announced huge staff cuts barely months after privatisation, meaning that the remaining staff are dealing with an unmanageable workload. Some junior officers in CRCs are now handling more than 200 cases each, despite 60 cases being the maximum it is recommended to handle safely. Working Links collapse - what happened? Working Links is a company that was responsible for probation provision in Wales and the South West. In February 2019, it went into administration. The collapse was in part due to their holding of three loss making contracts, which caused significant financial pressures on the company. But aside from the financial disaster at Working Links, the company was also mismanaging the services it was providing. On the day the company collapsed, the Chief Inspector of Probation, Dame Glenys Stacey released a damning report into one of Working Links' CRCs. Aims of reducing re-offending and protecting the public were secondary to aims of avoiding financial penalties triggered by contractual targets. A severe lack of staff capacity to deliver high quality services. Leadership, staff, services, planning, and implementation and delivery were all inadequate. The Working Links collapse shows us that the private sector is ill-equipped to deliver effective probation services. It also shows us that market forces is a dangerous principle to introduce into such a vital public service. David Gauke: Bring probation back into public ownership! Our probation service was broken up and privatised by Chris Grayling in 2015. Now it is collapsing, and we need to act fast. Sign here to call on Justice Minister David Gauke to bring the probation service into public ownership as soon as possible. Bring probation into public ownership - sign now!